Line baking sheet with waxed paper or foil; set aside. Cut each banana in half. Insert ice cream stick halfway into each banana. Place on prepared baking sheet; freeze 1 hour. Stir chocolate chips and oil in small saucepan over low heat until melted and smooth. Place toppings on individual plate, if using; set aside. Remove pops from freezer. Spoon chocolate over each banana while holding over saucepan. Roll in toppings. Return to freezer to harden, about 1 hour. Store in airtight container or resealable freezer food storage bag. 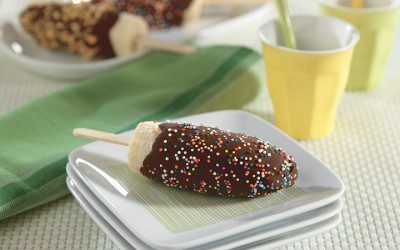 Note: If desired, bananas can be cut into 1-inch pieces, frozen, then dipped in chocolate for individual bites. *Note: You may substitute 6 baby bananas. Exchanges per serving: 1 Fat, 1 1/2 Fruit.